Chinese 7.62 x 51 with RG 60 L2A2 headstamp? I was going through my 7.62X51 ammo and I found some stuff that I have set aside until I could figure out what it was. It has the following headstamp: RG, 60, Nato Circle/Cross, L2A2. First impression is that is is Radway Green, which would be good. However, it has a seel case and a steel bullet (by magnet). Do not think RG did any steel cases. The case has a coloring on it to make it appear like it is really brass. I have heard that this ammo may be a Chinese knock-off and it may be corrosive. Does anyone have any info on this ammo? I worry about it being corrosive. Yes, it’s a Chinese copy, but decent shooting ammo. I have heard both corrosive and non, so I have just treated it as corrosive and cleaned accordingly. Yes, this is Chinese. I can not imagine what they were thinking when they copied a British headstamp but used a very obviously Chinese copper washed steel case and projectile jacket. It is lead cored and probably corrosive primed. AKMS - Remember, when you say “obviously,” it is obvious to most of us, but we’re are not the average when it comes to spotting stuff like this with ammunition. The group of truly active cartridge collectors by and large know more about this sort of thing in ammo than do many large police agencies, governments, etc. That is why we are called on for help in identifying thigs. It is not obvious to everyone (even if it should be). That’s why I love this Forum - there is so much I learn in every field by the real experts that help us identify stuff here, including you. It would be impossible for me to expalin how much information from this forum has added to my own library and to my knowledge of ammunition. Remember who has written the largest part of the body of knowledge on ammunition - it is not Governments or people casually involved with ammunition. It is gun and cartridge collectors who write most of the books. Also at the same time as Norinco hyad copied the US M14 (Model 305), intending to give them to Separatist groups in the Philippines and elsewhere. Even the stripper clips in the 300 round Loose pack tins were Fake…with matching British makers marks. Anyway, the operation fell through (someone realised that RG did not make Copper washed 7,62 ammo ( and it would not have the “L2A2” mark, which was for a brass case design)… so the idea was quietly forgotten about, and the Semi Auto vewrsions of the 305 sold into Australia and the USA etc, with bayonet lugs removed, as “Sporting Rifles” (if tuned up, they are good shooters. As to the ammo, it is VERY corrosive ( some very much later batches of Norinco 7,62x51, may be “non-corrosive”, but all the L2A2 Fakes are very corrosive. (1970s-80s manufacture). All the 600 rounds of the ammo I had I dismantled, tossed the powder into the garden,gave the steel jacket/steel core bullets to a friend who manufactures Vests for Police and Army, for testing kevlar and ceramic plates, and used the steel cases to make 7,9x33 Long Blanks. I have both the MTY 60 and an MTY 58 charger. Are they both chinese? I would need to see the MTY 58 Clip to make an assessment of it. I do know of a Mk. 2 Charger (two stops on each side) marked “MTY 57” so the “MTY 58” could be real? 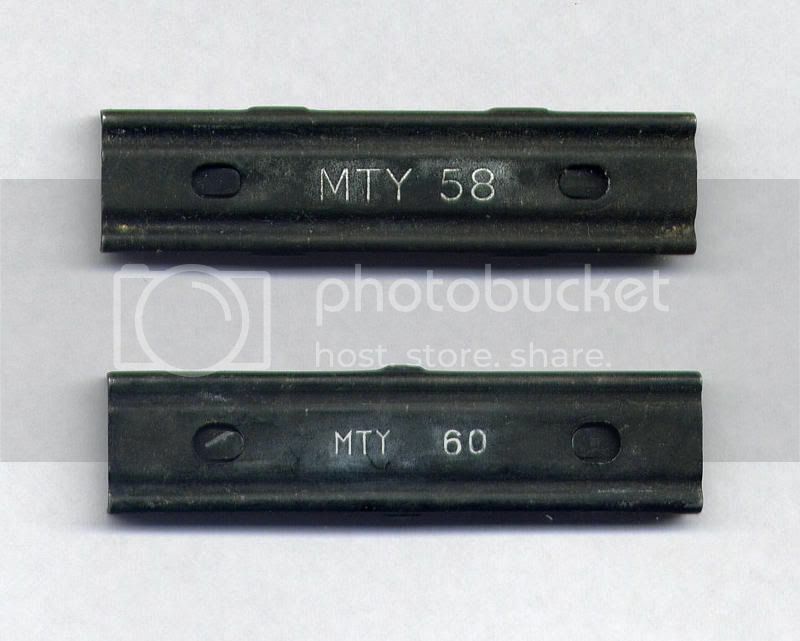 How closely dose your “MTY 58” Charger match the “MTY 60” in the way its manufactured and the style of Font of the stamping? Maybe the “MTY 60” clips are original British clips that the Chinese have reused? Without an original British MTY example to study and measure this clips will continue to stay as being a ‘fake’. Certainly certain characteristics of the “MTY 60” doesn’t match other British production Chargers. If you can send me some pics of your “MTY 58” and “MTY 60” clips (one above the other) I will have a look and see what I can figure out. I tried to scan these but with poor results, I will try again tomorrow. My MTY 58 is a Mark 2 (two stops) and the lettering is larger. The information on the RG fakes is greatly appreciated and beneficial. OK, here are my scans. The MTY 58 is a Mark 2 type with two stop lugs on each side. The MTY 60 one is a Mark 3 type with a single stop lug on each side. They are clearly very different, even the style of lettering is different. Well that certainly dose answer the question the “MTY 60” clips are 100% fake, not only is the font totally different you can also see the holes for retaining the spring are a lot smaller then the “MTY 58” example. Even though I don’t have the MTY examples I now have been told of a “MTY 57” and “MTY 58” Mk. 2 clips. It’s very possible Mettoy never continued to produce any more chargers/stripper clips past the Mark 2 design. The Mark 3 (single stop) Canadian design was accepted in 1960 as the standard for the ABC (Australia, Britain Canada) countries and formed the bases for the new NATO standard of stripper clips. If you ever come across any other “MTY 57” or “MTY 58” chargers (or in fact anything not shown on the website) that are ‘spares’ I would love to do a trade to get examples I could measure and study for my research. I’ve closely scrutinised a lot of American stripper clips and found there are at least 3 variations of the retaining spring (meaning 3 changes in the design), unfortunately American clips aren’t year dated so it’s impossible to tell when these changes took place. American stripper clips were based on the single stop Mk.3 Canadian design. All countries supplying ammunition and it’s components to NATO had to conform to the STANAG specifications for that item. Thus stripper clips from Canada, UK, America, Italy, The Netherlands, FN etc had to be made to the same tolerances. Even though Australia wasn’t part of NATO, it still had to conform to Canadian and British standards, thus in-turn their stripper clips conformed to the NATO standards. I have the same problems with the “M1903” clips, I have five variations and can only guess at the chronological order even, let alone model type. Just an observation on the “one stop” (definitive Nato clip for 7,62x51) and the earlier “two-stop” (Mauser rifle style clip). It occurred to me that whilst the developmental stages of the stripper clip( and FN-FAL rifles etc) to use 7,62 ammo were predicated on the Mauser style clip and the shallow clip guide slots in the receiver, the “Mark 2” clips could also be used with Converted Bolt action rifles (ie, Mausers) which were already set up for a two stop clip…The width of the clip seems to be of importance as well, since the Mauser clip comes in two widths, the export size( for 7mm, 7,65mm and .30/06–mostly Latin American) and the narrow size, for 7,9mm (virtually restricted to German M98 rifles). FN would have been looking at the latin American markets, already floodend with Wide cliped Mausers in various calibres, and some did convert Mausers into Police and training rifles in 7,62, whilst adopting the FAL designs in the 1950s…The two stop clip works very well here, although the later single stop design does work, albeit a bit stickily, in most Mausers as well. Any Israeli(Hebrew) marked clips out there? measurements please? [quote=“DocAV”]Just an observation on the “one stop” (definitive Nato clip for 7,62x51) and the earlier “two-stop” (Mauser rifle style clip). You could well be right about your theory of the two-stop design so it could be used in Mauser type rifles (excluding the 7.92 models). I’ve just tried a variety of Mauser clips in a charger loading top cover for a FAL and they all fit (except K98 type). The design was of British origin, dating from 1955 and was originally called " CHARGER X2E1 ", there was also a comment in the title stating " TO HOLD 5 ROUNDS; SPRINGFIELD TYPE " The title was changed in 1956 to " CHARGER, 7.62MM AMMUNITION, Mk2 ". The US clip was finalised in Jan 1958 and going by the design is based on the Canadian charger. I’m waiting on an Israeli 7.92/7.62 marked clip at the moment, I would say it’s a standard K98 type clip that is duel marked and won’t fit any NATO sized stripper clip grooves.